I have to imagine it was at least a little bit uncomfortable for John C. Reilly the first day on the set of Stan & Ollie—and I'm not referring to the prosthetic belly and jowls he wears through much of the film while portraying Oliver Hardy. No, it's more that his Dewey Cox in Walk Hard skewered entertainer biopics so ferociously it's tough to imagine how they ever walked again. There would seem to be an infinite number of ways to tell the story of well-known subjects cinematically, but it seems as though filmmakers generally only choose one: Earnest, thorough and mostly interested in offering an opportunity for actors to do convincing impersonations. 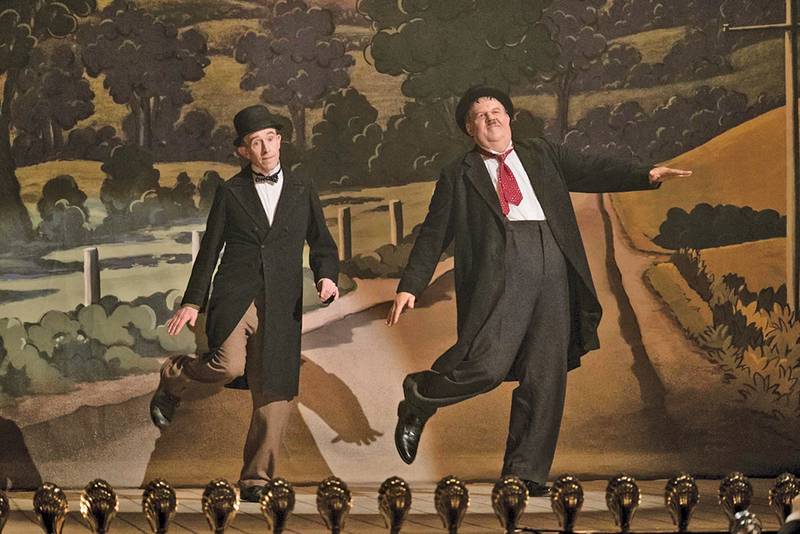 To Stan & Ollie's credit, screenwriter Jeff Pope (Philomena) and director Jon S. Baird (Filth) seem interested in dodging most of the genre's pitfalls. Instead of a cradle-to-grave history of Stan Laurel (Steve Coogan) and Oliver Hardy, they focus almost entirely on the twilight of the comedy team's career. After a brief prologue set during their heyday in 1937, the narrative sprints forward to 1953 as Laurel and Hardy prepare for a theater tour of the U.K., trying to drum up interest in a comeback film project. While it might not be wildly original to focus on fading stars attempting to recapture old glory, Stan & Ollie leans into the notion that its subjects are perpetually "on" as performers, delighting in turning the mere act of checking into a low-rent hotel into an extended shtick exclusively for the benefit of the clerk. The whimsical woodwind-heavy score by Rolfe Kent emphasizes a lightness in tone; if there's angst to be found in the lives of these aging ex-stars, you're not going to find it here. Nor is there a desire to underline how different the two men are in private compared to their on-screen personas. Initially, there's an obvious incongruity to the portrayals—the fuming, uptight Ollie of their films shown to be the easygoing, appetites-driven guy everyone knows as "Babe," and the befuddled, naive Stan revealed as the workaholic creative force behind most of their material. But the performances by Reilly and Coogan hit more than one note; we get to see Stan's anxiety over not being able to pull together the project he so desperately wants and Ollie's low-key embarrassment over being perpetually broke. Reilly might be a better physical match for the man he's playing—and better at playing his character's distinctive performing tics—but both actors create multi-faceted characters. The narrative itself feels most promising when Stan & Ollie explores the relationship between these two men as less a friendship or even a professional partnership than a marriage. We learn early on that there was a strain in that relationship over Hardy's decision not to support Laurel's desire to push producer Hal Roach (Danny Huston) for a more favorable contract, resulting on Hardy working with a cheap Laurel substitute on what they awkwardly call "the elephant picture." At times, the story plays out like a couple trying to move past an infidelity, to the point where we find them trying to reconcile differences while sitting in the same bed together. It's a solid enough set-up; the screenplay just mostly seems content to cruise along on the gentle goodwill of two leads playing legends and watching themselves become obsolete, like when Laurel stares sadly at a poster for 1953's popular comedy team-du-jour, Abbott and Costello. The arguments erupt at predictable moments, never quite developing into a compelling tension. It's fascinating watching Stan & Ollie catch fire as soon as Nina Arianda and Shirley Henderson—as Stan and Ollie's respective wives—become prominent characters late in the film. They play off one another gloriously, capturing such a fascinating dynamic—women barely pretending to tolerate one another because their husbands are friends—that it's hard not to wish for a movie that was entirely about them. Instead, we get a movie that avoids some of the worst failings of biopics, but can't avoid all of them—like the ever-aggravating decision to show the real Laurel and Hardy at the end of the movie, as if to elbow us into thinking, "Hey, they copied those real guys pretty good!" While it's pleasant enough for a while, it can't manage to become—in the immortal words of Dewey Cox—a beautiful ride.